DreamWorks Records was an American record label founded in 1996 by David Geffen, Steven Spielberg and Jeffrey Katzenberg as a subsidiary of DreamWorks SKG. The label operated until 2003 when it was sold to Universal Music Group. The label itself also featured a Nashville, Tennessee-based subsidiary, DreamWorks Nashville, which specialized in country music and was shut down in 2005. The company's logo was designed by Roy Lichtenstein and was his last commission before his death in 1997. Hard Rain Don't Last is the debut album of country music singer Darryl Worley. It was released on July 18, 2000 via DreamWorks Records. The tracks "When You Need My Love", "A Good Day to Run", "Second Wind" and "Sideways" were all released as singles from this album. While the first three singles all reached Top 20 on the Hot Country Songs charts, "Sideways" peaked at #41. "I Miss My Friend" is a song written by Tom Shapiro, Mark Nesler and Tony Martin, and recorded by American country music singer Darryl Worley. It was released in March 2002 he first single and title track from his album of the same name. The song became his first number one single on the Hot Country Singles & Tracks chart. It also crossed over to pop radio, peaking at #28 on the Billboard Hot 100. Darryl Wade Worley was born October 31, 1964, in Memphis, Tennessee, to Tommy and Bonnie Worley. His family moved to Pyburn, Tennessee, when he was young and he was raised there. His father was a Methodist preacher and his mother sang in the church choir. Worley attended the University of North Alabama and earned a degree in biology and chemistry. He worked in the chemical industry prior to pursuing country music, and wrote for FAME Studios in Muscle Shoals, Alabama. One of his first cuts as a songwriter was a track on Archer/Park's 1994 debut album. Pyburn is an unincorporated community in Hardin County, Tennessee, United States, in the southwestern part of the state. It is the birthplace of the country music singer Darryl Worley. The University of North Alabama (UNA) is a coeducational university located in Florence, Alabama. It is the state's oldest four-year public university. Occupying a 130-acre (0.5 km2) campus in a residential section of Florence, UNA is located within a four-city area that also includes Tuscumbia, Sheffield and Muscle Shoals. The four cities compose a metropolitan area with a combined population of 140,000 people. Worley was signed to DreamWorks Records in 1999. His debut single "When You Need My Love" followed in March 2000, the first of four single releases from his debut album Hard Rain Don't Last . Following this song were "A Good Day to Run", "Second Wind" and "Sideways". Respectively, these singles peaked at No. 15, No. 12, No. 20 and No. 41 on the Billboard country charts. Production duties on the album were split between Frank Rogers and James Stroud. Also in 2000, George Jones charted with the single "Sinners & Saints", which Worley co-wrote. "When You Need My Love" is a debut song co-written and recorded by American country music artist Darryl Worley. It was released in March 2000 as the first single from his debut album Hard Rain Don't Last. It peaked at #15 on the United States country chart and at #75 on the Hot 100. It also peaked at #30 on the Canadian country chart. The song was written by Worley and Wynn Varble. "A Good Day to Run" is a song co-written and recorded by American country music artist Darryl Worley. It was released in September 2000 as the second single from his debut album Hard Rain Don't Last. It peaked at number 12 on the United States Billboard Hot Country Singles & Tracks chart and at number 76 on the U.S. Billboard Hot 100. The song was written by Worley and Bobby Tomberlin. Frank Mandeville Rogers V is an American record producer, songwriter and session musician. In 1990, Rogers moved to Nashville, attending Belmont University and graduating with a Music Business degree. While at Belmont, he met friend and future collaborator Brad Paisley. After graduation, Rogers went to work for EMI Nashville Productions and opened up Sea Gayle Music Publishing with Paisley and Chris DuBois. The successful publishing company, has over 300 cuts and 28 number one songs. The three business partners, in late 2009, also teamed up with Sony Nashville to form Sea Gayle Records, with a roster that includes Jerrod Niemann. His second album, I Miss My Friend , followed in 2002. Its title track became his first Number One hit on the country charts that year, and was followed by the top 30 "Family Tree", written by Darrell Scott. This album was also his first Number One album on Top Country Albums. James Darrell Scott, known as Darrell Scott, is an American singer-songwriter and multi-instrumentalist. The son of musician Wayne Scott, he moved as a child to East Gary, Indiana. He was playing professionally by his teens in Southern California. Later, Darrell moved to Toronto then Boston. He attended Tufts University, where he studied poetry and literature. He has lived in Nashville, Tennessee since about 1995. He has written several mainstream country hits, and he has also established himself as one of Nashville's premier session instrumentalists. His younger brother, David Scott, occasionally accompanies Darrell on the keyboard. 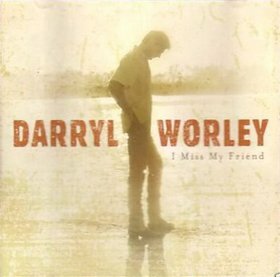 2004 saw the release of Worley's third studio album, the self-titled Darryl Worley . Its lead-off single, the Harley Allen co-write "Awful, Beautiful Life", became his third Number One hit in early 2005. Following this song was the Top Ten "If Something Should Happen", as well as "I Love Her, She Hates Me", which stopped at No. 56 due to the closure of DreamWorks Records in mid-2005. Worley signed in 2008 to his third recording contract, this time with Stroudavarious Records, a label that Stroud founded in 2008. His sixteenth chart entry, "Tequila on Ice", was issued in the middle of that year, peaking at No. 44. Following it was "Sounds Like Life to Me", which has reached the Top 20. Both songs are included on his fifth release, Sounds Like Life . The album's third and final single was "Best of Both Worlds." He married his first wife, Beverly Irwin on May 12, 2001. Worley opened a restaurant, the Worleybird Cafe, in Savannah, TN, with his wife, Beverly (whom he divorced in July 2006)  He also has a vegan restaurant in Dothan, Alabama, located at Country Crossing. (In August 2016 he told morning radio hosts Flip & Streeter in Panama City, FL, that he never owned a vegan restaurant in Dothan and joked that "it should be treason" that this claim was made since he is not a vegan) He also has two brothers, Tommy and Barry. Worley has been married to Kimberly Lee Perkins since December 2007 with whom he has a daughter, Savannah Gail born March 24, 2008. Worley also formerly owned a boutique furniture store in Enterprise, Alabama. ↑ "When You Need My Love" also peaked at number 30 on the Canadian RPM Country Tracks chart. ↑ "Second Wind" did not enter the Billboard Hot 100, but peaked at number 11 on Bubbling Under Hot 100 Singles. ↑ "I Just Came Back from a War" did not enter the Billboard Hot 100, but peaked at number 15 on Bubbling Under Hot 100 Singles. 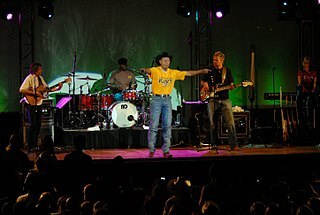 Hubert Neal McGaughey Jr., known professionally as Neal McCoy, is an American country music singer. He has released 10 studio albums on various labels, and has released 34 singles to country radio. Although he first charted on the Billboard Hot Country Songs chart in 1988, he did not reach the top 40 for the first time until 1992's "Where Forever Begins", which peaked at number 40. McCoy broke through two years later with the back-to-back number one singles "No Doubt About It" and "Wink" from his platinum-certified album No Doubt About It. Although he has not topped the country charts since, his commercial success continued into the mid to late 1990s with two more platinum albums and a gold album, as well as six more top 10 hits. A seventh top 10 hit, the number 10 "Billy's Got His Beer Goggles On", came in 2005 from his self-released That's Life. Daryle Bruce Singletary was an American country music singer. Between 1995 and 1998, he recorded for Giant Records, for which he released three studio albums: Daryle Singletary in 1995, All Because of You in 1996 and Ain't It the Truth in 1998. In the same timespan, Singletary entered the top 40 of the Hot Country Songs charts five times, reaching number two with "I Let Her Lie" and "Amen Kind of Love", and number four with "Too Much Fun". "Find Out Who Your Friends Are" is a song written by Casey Beathard and Ed Hill, and recorded by American country music artist Tracy Lawrence. It was the lead-off single for his album For the Love, which was released in early 2007 on Rocky Comfort Records, a label which Lawrence owns. The song was originally released to radio stations on August 21, 2006, ahead of its album release on January 30, 2007. The single did not enter the Top 40 on the Billboard Hot Country Songs chart until January 2007. "Awful, Beautiful Life" is a song co-written and recorded by American country music artist Darryl Worley. It was co-written with Harley Allen. It was released in June 2004 as the lead single from Worley's self-titled album. The song became his third and most recent No. 1 hit on the Billboard Hot Country Singles & Tracks chart in January 2005, holding the position for two weeks. "Where Would You Be" is a song written by Rachel Proctor and Rick Ferrell, and recorded by American country music singer Martina McBride. It was released in May 2002 as the third single from her Greatest Hits album. The song peaked at number 3 on the U.S. Billboard Hot Country Singles & Tracks chart. Craig Morgan is an American country music artist. His discography comprises seven studio albums and two greatest hits albums, plus twenty-five singles. He debuted in 2000 with a self-titled album on Atlantic Records Nashville. After Atlantic closed its Nashville division in 2001, he signed to the independent Broken Bow Records and released three studio albums: I Love It, My Kind of Livin' and Little Bit of Life, released in 2003, 2005 and 2006 respectively. He also released a greatest hits album in 2007 on Broken Bow before leaving the label. In 2008, he signed to BNA Records and released That's Why, which was re-issued in 2009 with three tracks changed. My Kind of Livin' is also his best-selling and highest-charting album, having peaked at number 7 on Top Country Albums and been certified gold by the Recording Industry Association of America. The discography of Joe Nichols, an American country music singer, consists of twenty five singles and nine studio albums. "If Something Should Happen" is a song written by Dave Turnbull, Jim Brown and Dan Demay, and recorded by American country music artist Darryl Worley. It was released in February 2005 as the second single from his self-titled album. It peaked at #9 on Billboard magazine's Hot Country Songs chart for the chart week of June 5, 2005. Hillary Dawn Scott-Tyrrell, known professionally as Hillary Scott, is an American singer and songwriter. She is the co-lead singer of Lady Antebellum, a country music group that was formed in 2006, and is signed to Capitol Nashville. With her family, she released the top 10 album, Love Remains, in 2016. "I Just Came Back from a War" is a song co-written and recorded by American country music artist Darryl Worley. It was released in September 2006 as the second single from his album Here and Now. It peaked at number 18 on Billboard magazine's Hot Country Songs chart and reached number 15 on the U.S. Billboard Bubbling Under Hot 100. The song was written by Worley and Wynn Varble. 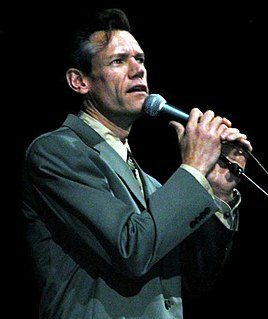 Randy Travis is an American country music singer. His singles discography comprises 58 singles and 34 music videos. George Edwin Varble is an American country music musician and songwriter. Varble co-wrote the hit songs Have You Forgotten?, Waitin' on a Woman, Things That Never Cross a Man's Mind and A Little More Country Than That. ↑ Phares, Heather. "Darryl Worley biography". Allmusic. Retrieved February 4, 2009. ↑ "Sounds like a new CD for Darryl Worley". Country Standard Time . March 6, 2009. Retrieved May 4, 2009. ↑ "Darryl Worley, Wife Beverly file for divorce". Country Music Television . August 16, 2006. Retrieved July 25, 2009. ↑ "Darryl Worley in Playgirl magazine". Great American Country . June 6, 2007. Archived from the original on September 9, 2012. Retrieved July 25, 2009. 1 2 "Darryl Worley Album & Song Chart History - Country Albums". Billboard . Prometheus Global Media . Retrieved December 11, 2010. 1 2 "Darryl Worley Album & Song Chart History - Billboard 200". Billboard . Prometheus Global Media . Retrieved December 11, 2010. ↑ "Darryl Worley Album & Song Chart History - Independent Albums". Billboard . Prometheus Global Media . Retrieved December 11, 2010. 1 2 "RIAA - Gold & Platinum - February 27, 2009: Darryl Worley certified albums". Archived from the original on June 26, 2007. Retrieved February 27, 2009. ↑ "Darryl Worley Album & Song Chart History - Country Songs". Billboard . Prometheus Global Media . Retrieved December 11, 2010. ↑ "Darryl Worley Album & Song Chart History - Hot 100". Billboard . Prometheus Global Media . Retrieved December 11, 2010. ↑ "Darryl Worley – Rainmaker". Daily Play MPE. Retrieved May 7, 2016. 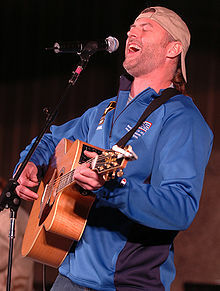 Wikimedia Commons has media related to Darryl Worley .